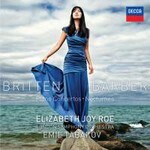 This solo release, a unique coupling of two of the 20th Century's greatest piano concertos marks Decca's first-ever recording of the Barber concerto and the first of the Britten since the classic Richter account conducted by the composer in 1970. Elizabeth Joy Roe has been performing both works since a student at Julliard and has written extensive booklet notes which detail the intriguing parallels between the two composers. Her New York concerto debut was in the Britten conducted by James Conlon at Alice Tully Hall, Lincoln Center and in 2003 she was invited to replace the Barber concerto's dedicatee, John Browning, at a performance with the Delaware Symphony shortly after Browning's death. The album is completed with two solo piano nocturnes by each composer: Britten's 'Night Piece' and Barber's 'Nocturne - Homage to John Field', widely-considered the father of the nocturne.